I have had a good, but difficult day in some ways. I am completely beyond knackered. I am so tired that I was falling asleep standing up this afternoon and I think that is quite an achievement! Most of my friends will know that when I am this tired then anything out of what I expect will throw me. This is kind of OK when it is small things, but not so good when it potentially could upset people you love and don’t want to hurt. That’s kind of what happened this weekend. I survived the day, and had a good time, but I have also been quite grumpy and the worst bit is that I know I have been. I had to go back to the car for a little sleep in the middle of the afternoon because I had reached the point of just not coping. It’s just hard to manage a new job which is incredibly challenging whilst trying to run a home and give quality time to The Mister and all the other people who want a piece of my time. I could do with curling up into a ball and hibernating tomorrow. Sadly that isn’t going to happen. The Constant Gardener by John le Carre is a cracking read. 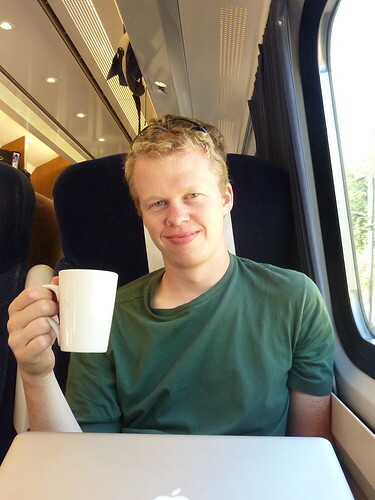 Justin Quayle is a British diplomat in the High Commission in Nairobi. His wife Tessa is investigating, along with her Dr friend Arnold Bluhm, the use of a drug for TB which is causing the deaths in many people. The drug is effectively being trialled in Africa, on people ‘who don’t matter’ so that it can be released in the Western World with no side effects. However, Tessa and Arnold are murdered and Justin sets out to investigate their deaths, whilst trying to avoid being killed himself. This is a great read, very exciting and a real page turner. My only complaint is that it is sometimes hard to know who is narrating the story and I had to re-read a couple of bits to make sure I was understanding. I have also seen the film of this novel and have to admit that it was really well done and worth a watch. The Last Anniversary by Liane Moriarty is a quirky and charming book and I really enjoyed it. Connie Thrum is the rather determined matriarch of a very unconventional family who live on the rather gorgeously named Scribbly Gum Island. For years she and her sister and other relatives have hid a huge secret. 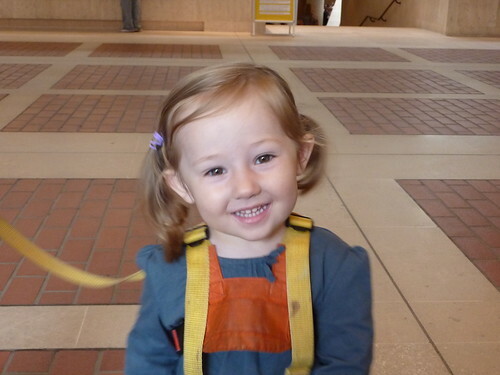 When Connie and her sister Rose were children the found a baby in an abandoned house. The parents had just disappeared and a marble cake was cooling on the kitchen table. Over the years they have used this ‘mystery’ to make lots of cash and the baby grew up in the care of the sisters and she was rather aptly called Enigma. When Connie dies she leaves a few rather surprising bequests, including leaving her house to Sophie, the ex-girlfriend of her sister’s grandson. The reason I loved this book is that it was easy reading and had really gorgeous characters. The story was quirky and random and really quite unexpected. I loved it. At A Time Like this by Catherine Dunne is quite a slow read. Four women gather together for a meal to celebrate their 25-year friendship. The book jumps about between time periods and is narrated by all the different women which made it both quite annoying to read, but also quite disjointed. I think sometimes this style works and sometimes it doesn’t – unfortunately it was the latter in this case. I found the characters shallow and selfish and I just didn’t feel that I would want to be friends with any of them!! Anyway, it passed the time of day whilst I commuted. It will go back to the charity shop now! The Infidelity Chain by Tess Simpsonis a pretty good read. Two married people (married to each other I mean! ), Jackson & Ella are having an affair with each other. In their opinions all is going well until Ella’s husband dies and things change dramatically. This book is narrated both by Ella and Jackon, but also by Jackson’s wife and daughter. It’s a clever book in that you find the same conversations repeated in the next chapter, but from another person’s perspective. It quite clearly shows that infidelity is not only a bad idea, but that it affects so many more people than just those directly involved in the affair. Where Rainbows End by Ceclilia Ahern is a sweet little book. The whole book is written in the form of letters, emails and msn messages which makes it really quick to read. Starting with the friendship of Rosie and Alex whilst they are still at primary school the book follows their friendship and their love lives right through until they are 50. All the way through it I spent my time wondering why they didn’t pull themselves together and have a relationship… finally it all works out in the end. A very typical chick lit book but I like the way Ahern writes – she is one of the better authors! The Secret Friend by Chris Mooney is crime fiction, in the same ilk as Kathy Reichs and those sorts of authors. Two girls go missing and many years later their bodies are found. No-one knows where they have been and who might have killed them. Another girl goes missing and the race is on to try and find her before she has the same fate as the other girls. Add to that one renegade ex-FBI agent and it makes it all even more exciting. A good book, not quite in the same league as some of the other crime writers, but a good story all the same. The Good Guy by Dean Koontz is a thriller and a bit of a page-turner which made it quite a quick read! Tim Carrier is sitting in his local bar having a beer when a man comes in and clearly thinks he who someone who has been hired to kill a woman called Linda. Being the model citizen he is he decides to warn this woman and there starts a game of cat and mouse. Pretty exciting read and I enjoyed it. Brother Odd by Dean Koontz is, quite frankly, an odd book. Set in a snowbound monastery the main character is a man called Odd Thomas. He has a psychic gift and sees all sorts of evil and demons and to be honest they seem to follow him all over the place! He gets the sense that something dreadful is about to happen and he is in charge of stopping it. It was a very exciting story, but also very, very peculiar. At times I found myself really confused by what was going on. The cross-over between what was the real world and what was the spirit world was sometimes not so clearly defined, but it was a fascinating book. Apparently this was the third in a trilogy about Odd Thomas, so maybe I will read them in reverse order! The Secret Life of Evie Hamilton by Catherine Alliott is good chick-lit. I know some people might think that is an oxymoron but it really is good chick-lit. So often books in that category are predictable and the characters are either nasty or nice but nothing in between. Evie Hamilton is a privileged middle-class mother of one daughter, married to an Oxford don living a rather charmed and easy life. Things get complicated when her husband finds out that he has another daughter, conceived after a one-night stand when he was engaged to Evie. The book shows Evie spectacularly losing it, but also eventually coming to terms with the situation and the characters are lovely. I feel like they could be people I know. I enjoyed it. A good read! The Cellist of Sarajevo is a truly beautiful book. Whilst the book follows the fictional lives of three people living in Sarajevo during the siege the cellist is based on a the real-life story of the cellist who sat and played in the burned out mortar crater for 22 days following the deaths of 22 people who were queuing for bread. He played the beautiful and haunting Albinoni’s Adagio, risking his own life but serving as a memorial for the dead. The book is sad, and, I suspect, shockingly accurate with regards to the atrocities that happened in the city. Well worth a read. I thought the book Anyone Can Do It by Duncan Bannatyne would be really quite annoying and I would just found him very arrogant. I have to admit that at some points this thought did cross by mind, but the book also made me laugh and I found him very inspiring. One of the things I was most taken with was that Duncan Bannatyne was still bumming about on a beach in Jersey in his thirties and he didn’t actively start pursuing a business profile until after that. He is a true entrepreneur and he has invested in many different businesses over the year – he sees a gap in the market and gets on with it. One his most impressive investments was his business in the nursing and care home market – he wanted to build homes that were efficient but also compassionate. He also briefly mentions his charity work but didn’t dwell onto it too much. One of the only complaints I had about this book is that the grammar is dreadful and he needed a decent proofreader! Think I might move on to reading the rest of the books written by the Dragons. I can decide whether Bee Season by Myla Goldberg is an extraordinary book or a strange one. Maybe it is both. The book is about the Naumann family. A Jewish family whose daughter, Eliza, enters the school spelling bee and ends up going to the national competition. The first half of the book is about her journey from being fairly ordinary to a spelling genius. She always feels second place to her older brother, but her talent for spelling gives her some sort of kudos. The second half of the book shifts to becoming a story of the individuals who are trying to find enlightment. Her older brother Aaron turns against the religion of his birth and joins the Hare Krishnas and spends his time chanting whilst wearing saffron robes. Her father introduces Eliza to the writings of a Kabbalist mystic and she begins her only journey, chanting on words. Their mother is a kleptomaniac who has a breakdown. It really is an interesting book but I found it quite hard going in places. An interesting read in lots of ways. The Jewish aspects of family life were interesting and it was quite a deep thinking book. Good stuff. The Dead Room by Chris Mooney is a pacey crime novel. It sees the return of Crime Scene Investigator Darby McCormick. She is called to investigate the murder of a woman in front of her 11 year old son. He doesn’t die but tells Darby that he knows that his grandparents had been murdered too and he knows who did it. Then he tries to kill himself. The book is the unfolding of this case but also involves police corruption on a grand scale. A fairly straightforward but good read. This is a particularly attractive photo of me… circa about 1986/1987 (I think). I am posing with my clarinet wearing my Guernsey Music Centre tie. The fringe is dire don’t you think? I was reminded of this picture (which my Dad kindly showed during his speech at my wedding!) when I was watching the TV programme on Channel 4 called Orchestra United. Basically a conductor is taking young people who play instruments, but who have no opportunity to play in an orchestra, and turning them into a concert orchestra. I loved watching it… loved seeing how the kids were passionate about their music, and also how much they started to learn through playing with each other. I love that they recognised that whilst some of the kids weren’t musically brilliant, they had potential. Growing up in Guernsey we were extremely fortunate to have access to the most fantastic music service. Admittedly we worked really hard, from about 10am-3pm every Saturday, but I played in a Youth Orchestra, Concert Wind Band, Clarinet Choir and sang in the Guernsey Girls Choir and Guernsey Youth Choir. We had music and singing lessons, and aural and theory lessons were also included in the package. It was hard work and took up a lot of time, but when your best friends also play instruments and are in the same orchestras than it doesn’t seem to matter so much. It was fun, we had inspiring teachers and we worked hard but I wouldn’t have changed it for the world. Music made such a difference, both to my social life but also to my confidence. Since moving to Leeds I have been on a 10-week choral singing course and have loved it. I am still contemplating whether I will have the time to commit to a choir at the moment, but I have realised how much I love being in a choir. Music has always mattered to me, but there is something particularly special about working hard at something with your friends and achieving something great. I am looking forward to seeing whether Orchestra United manage it. Well The Mister and I went to London at the weekend. Even though I didn’t live in London before I used to go in every now and then. I hadn’t realised how much I was missing it until I went back. We went to stay with Cal and it was fab to catch up, we drank wine, gossiped and wandered around near her flat. It was lovely! 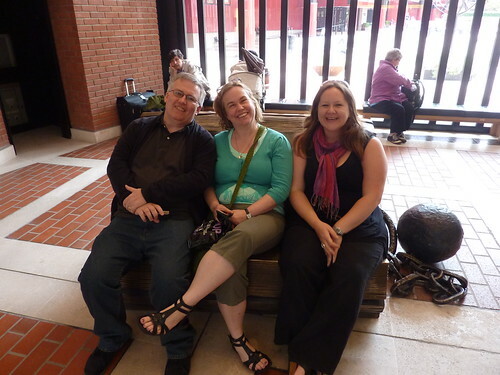 On Saturday we went to the Maps exhibition at the British Library with a few people from the Ship of Fools. That was follwed by a little lunch somewhere-or-other (no idea where!) 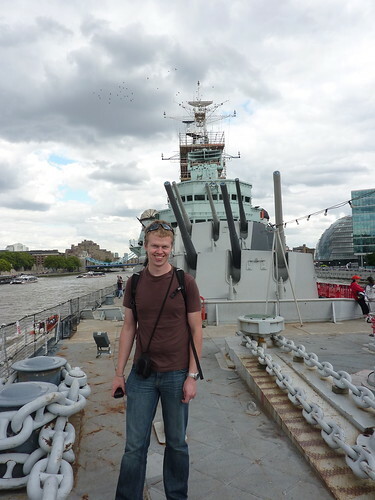 and then The Mister and I went to HMS Belfast. I felt like we should actually go and do something touristy! 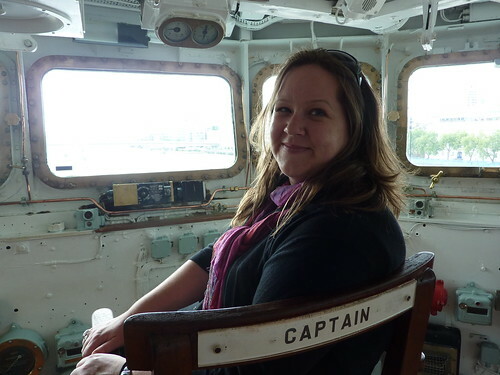 HMS Belfast was really interesting although the slight swell coupled with going up and down ladders into the bowels of the ship made me feel quite queasy. On Saturday evening we went to see Penn and Teller at The Hammersmith Apollo. I didn’t massively want to go, but I have to say that it was AMAZING! They were so clever and funny and I just couldn’t take my eyes off them when they were performing their illusions and tricks. It was brilliant! So that ended an extremely long and very full day. On Sunday we went for a little wander in the morning and then The Mister and I made our way to the train, via a little lunch with a couple of my cousins. We travelled back to Leeds in First Class. I never want to travel cattle class again. It was such a fab weekend. The perfect mix of seeing friends, going to fab events and having some time to ourselves. Perfect!!! Last weekend The Mister and I went to the Garforth Arts Festival along with Tom and Anne and the boys. We had no idea what this would be like. The website had very little information on it and all we knew was that there were some good artists playing. 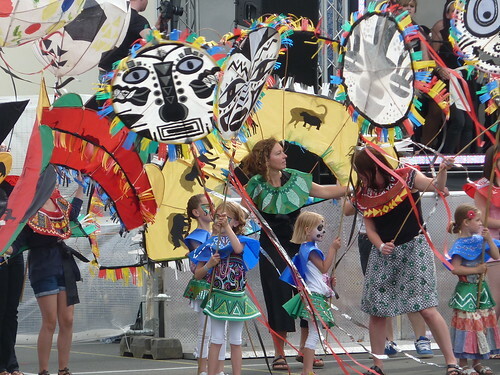 What we found was a rather brilliant local festival. Most of the afternoon was taken up by performances from the kids at the school and their various bands, and some of them were very, very good. They also had a parade of African music and dancing as the school is affiliated with a school somewhere in South Africa. 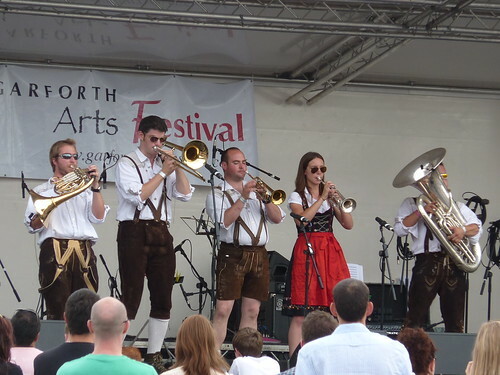 In the evening Oompah Brass played, dressed appropriately in lederhosen but rather less typically playing pop songs. The London Community Gospel Choir played and as always they were brilliant, followed by the rather bizarrely named Get Cape, Wear Cape, Fly who was pretty good and the evening was topped off with the brilliant Seth Lakeman. I am still amazed that they managed to get him to play at such a small, local event but it was fantastic. All in all it was a fab day. Great music, lovely weather and the chance to spend time with some of our best friends and their funny children. Matthew and Andrew kept us entertained all afternoon by dancing (oh and Andrew shuffling along on his bottom and thinking it was hilarious!) 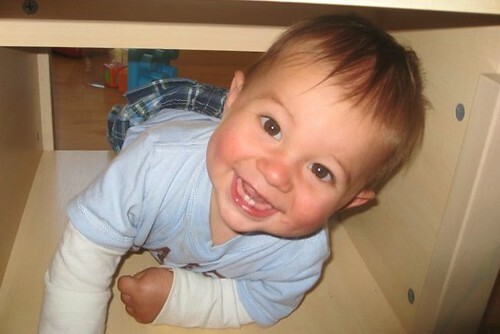 and baby Mark was just…. cuddly! 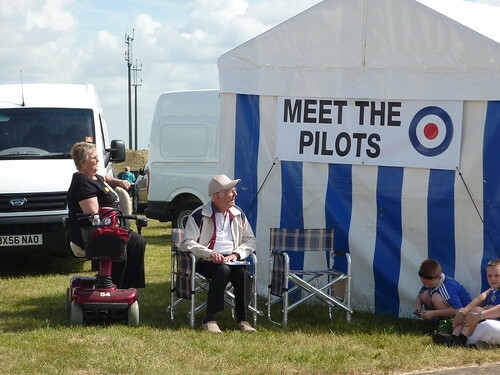 The Mister and I have had a really nice weekend at Waddington Airshow. 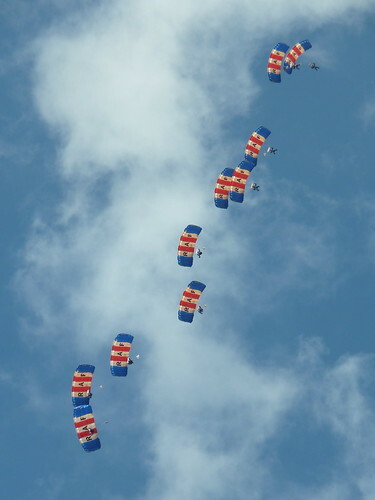 It is a gonormous airshow with a huge static display and a great flying show. 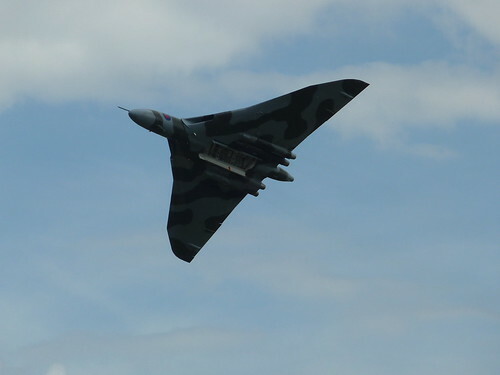 The Mister was pant-wettingly excited to actually get to see the Vulcan fly. Every airshow we have been to he has hoped that this plane would actually make it, and so far it has been absent. This time however, he was fortunate to see it (yeah it was good, but I am still not sure what is actually so great about it to be honest!) One of my favourite bits of the day was seeing a swing and jazz female harmony group called The Manhattan Dolls – they were brilliant! We also saw the Red Arrows who are always brilliant but they were missing one of the planes this time which made every formation look wonky and just not quite right. 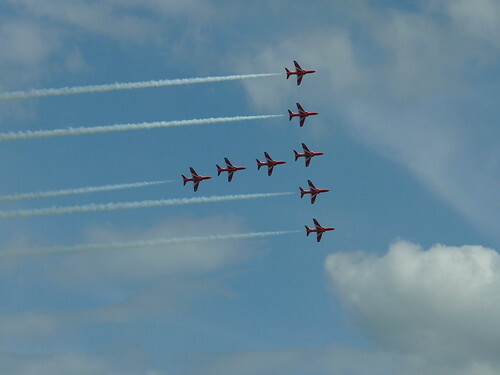 Anyway, we had a brilliant time and we stayed on the campsite next to the airshow which means we got to watch a bit more of today’s display whilst we were packing up (in gale force I might mention!) It was a great weekend, although The Mister and I have discovered that we are both grumpy little shites when we are tired and hungry! I think Barnabas likes his birthday present from us!!!! Look here for the video. Well our lovely nephew Barnabas is one year old today. 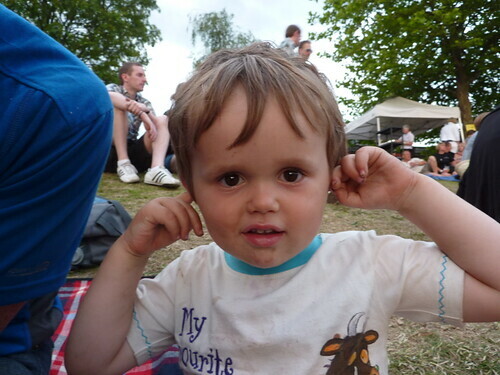 He is so gorgeous and a real little pickle and I miss him loads. The pain of not having children certainly hasn’t receded with him coming along, in fact in many ways it has made that pain more intense and more pronounced as I can see just what I am missing out on. Not knowing if we will ever get that experience is pretty hard to deal with. However, I certainly wouldn’t miss out on having Barnabas around. he is a complete joy and great fun and I can’t wait to see him again!! We bought Barnabas a big present but I couldn’t resist making him something (boys are so hard to make for!) 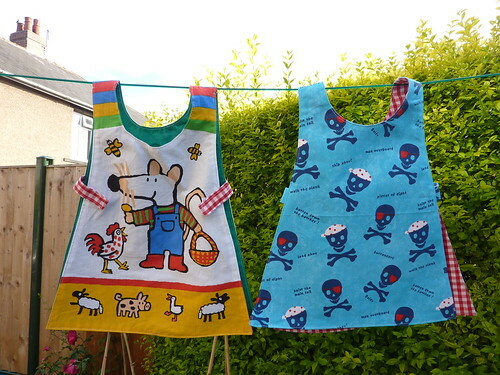 so I made him some little aprons which I thought he might be able to use when he is painting or colouring or cooking with Granny. Here’s a pic!